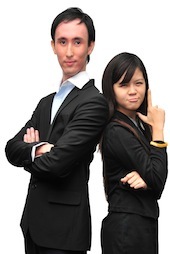 Shawn Yeo & Mandy Lim is the author of First Step to Scoring A1 in Chemistry. Shawn, a NTU graduate with honours in Bioengineering, is fascinated with the use of sciences in his everyday life. An enthusiastic and vibrant person by nature, shawn strongly believes in pursuing an all-rounded academic life. He is also a fervent believer that an optimistic mind and an active body can lead one to accomplish anything one sets their mind to. With proper time management, Shawn is convinced that an active lifestyle will not stand in the way of a student achieving good results, but will even help bring about better academic grades. Testifying to this belief, Shawn himself has excelled in his studies in spite of his wide interest and active participation in areas of dance, martial arts and music, just to name a few. A teacher who leads by example, Shawn hopes his students will not only focus on scoring well for their examination, but also lead fulfilling lives and emerge as confident and just individuals as they move forward in life. A dedicated Senior AdvoCoach who specialises in teaching ‘O’ Level Chemistry and Biology, Shawn is commited to making a positive difference in the lives of his students, by allowing them to experience success in these subjects have encountered great improvements in their grades under his guidance. Mandy Lim is a NUS graduate who majored in Applied Chemistry, Mandy has made learning Chemisty easy for students since she started teaching the subject in 2007. He major in university offers heran excellent insight into the subject and enables her to relate Chemistry concepts in an approach that is effectiveto her students. Mandy specialises in teaching ‘O’ Level Chemistry and in the course of her work, she motivates her students to strive for a higher standard of academic excellence. In her lessons, Mandy imparts learning strategies that are proven to be effective in tackling most examination questions. Her learning philosophy is to learn the essence of the subject and not memorise every single fact in the book. And even when memory work is required, it should be carried out in a fun way as she strongly believes that students tend to better remember facts when the learning process is interesting. Mandy’s students are very appreciative of her ability to tranform Chemistry, a seemingly boring subject in some classrooms, into a fun and lively learning subject. Needless to say, classes conducted by Mandy are consistently filled with laughter as she believes that engaging classes create a conductive environment for learning.